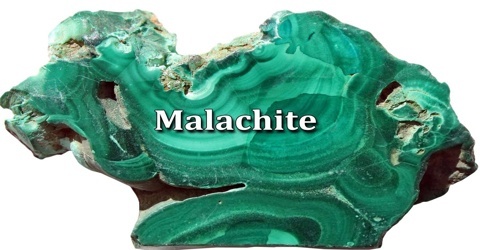 Malachite is a bright-green monoclinic mineral occurring as a mass of crystals (an aggregate) with smooth or botryoidal (grape-shaped) surfaces. It is often concentrically banded in different shades of green. It occurs together with the mineral azurite in copper deposits. Its chemical formula is Cu2CO3(OH)2. Malachite is generally found together with blue Azurite, and sometimes the two may occur admixed or banded together, forming what is commonly known in the gem and mineral trade as “Azure-Malachite”. 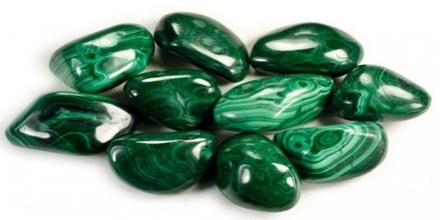 Malachite may also replace Azurite crystals, retaining the original Azurite shape but chemically altering it. Malachite was extensively mined at the Great Orme mines in the Britain 3,800 years ago using stone and bone tools. 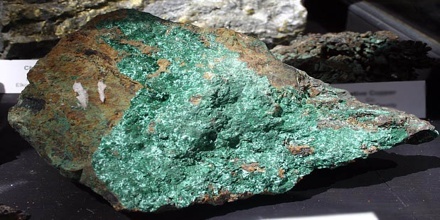 Acheological evidence indicates that mining activity ended around 600 B.C.E with up to 1,760 tonnes of copper being produced from the mined Malachite. 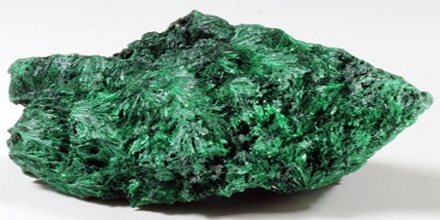 Malachite crystals sometimes form as needles that fan out from the rock in which they are embedded. More often, malachite forms as a mass with concentric bands of light and dark green. Such specimens are almost always internally banded in different shades of green, and can be seen when a specimen is polished or cut open. When the bands consist of concentric rings, specimens are highly prized. In ancient Egypt the colour green (wadj) was associated with death and the power of resurrection as well as new life and fertility. They believed that the afterlife contained an eternal paradise which resembled their lives but with no pain or suffering, and referred to this place as the ‘Field of Malachite’. Malachite, with its beautiful, rich green color, leaves no doubt of its importance as a jewel. Its opaque strength and power demands respect, mesmerizing the viewer. Yet the movement, flow and energy in its lines, circles and designs soothe and welcome. It is spiritually inviting. It is a protection stone, absorbing negative energies and pollutants from the atmosphere and from the body. It is also used for decorative purposes, such as in the Malachite Room in the Hermitage, which features a huge malachite vase, and the Malachite Room in Castillo de Chapultepec in Mexico City. “The Tazza”, a large malachite vase, one of the largest pieces of malachite in North America and a gift from Tsar Nicholas II, stands as the focal point in the center of the room of Linda Hall Library. Reference: desertusa.com, dictionary.com, crystalvaults.com, minerals.net, wikipedia.